Hello, my name is Dylan Williams. I’m originally from North Wales but have been living and working in Korea for over 10 years. 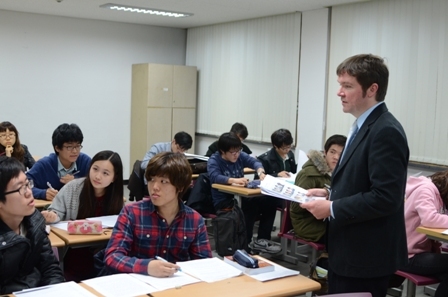 I currently work as an English lecturer at Seoul National University where I teach intermediate to advanced adults. I am an an alumnus of Manchester University where I completed my TESOL MA in 2010. The research for my dissertation focused upon the role L1 plays in helping students produce the L2 when they are engaged in oral pair-work tasks. 1. Does use of Korean, enable adult intermediate Korean English language learners to produce the English language in collaborative oral tasks? 2. What cognitive processes are triggered by the use of L1 in collaborative oral tasks? 3. How do the learners feel about L1 use during collaborative oral tasks in the English language classroom? If you are interested in reading my dissertation a link to it can be found in the reference below. I will be embarking on the PhD Education program this fall (2012). In the program I will be expanding upon my MA research. My proposal aims to explore how guided autonomous training affects students’ use of their first language to help them produce the second language while engaged in oral pair work tasks. In other words, how does their choice to use their first language as a learning tool alter as they are made aware of their dependency upon this learning tool which is at their disposal. The analysis of my research will also involve me exploring multilingual research and how this can effectively be undertaken when the main researcher does not possess fluency in the first language of the research subjects. Does a guided autonomous approach affect the use of L1 by adult intermediate Korean language learners in collaborative oral tasks? What cognitive processes are altered by a guided autonomous approach into the use of L1 in collaborative oral tasks? How do the learners perceptions about L1 use during collaborative oral tasks in the English language classroom alter as they become autonomously aware of its use? to contribute to the relatively under explored body of inquiry into how multilingualism can be effectively researched by a researcher who lacks bilingual proficiency. I will be undertaking my PhD in context which means that my attendance at Manchester will be quite sporadic for the duration of the program. I’m looking forward to getting started and to meeting you if our paths cross during my Manchester visits.